Churches happen to be one of the best applications for demand management. In most cases their energy use is low (relatively speaking), but is compressed into short periods of time creating very predictable peaks… which as you may know is ideal for demand management. Brayden Automation has worked with numerous churches over the years and we’ve come across many types of church applications. More recently, we’ve worked with two churches each using Energy Sentry demand controllers in a somewhat unique way. In the majority of church applications we come across, the goal is to stay under a certain kW level. Most utilities have a tiered rate system for small, medium and large commercial customers. In most cases the small commercial rate is a non-demand rate that charges a bundled kWh energy charge only. For many of these churches, the goal is to get on and stay on the small commercial rate, meaning they need to keep their demand under a certain kW threshold. For other churches, the objective is simply to reduce every kW of demand possible to limit their monthly demand charge. Normally these are larger churches that have no chance of getting on a lower rate category. Then there are unique applications we stumble upon that use a combination of strategies, such as Solar and Time-of-Use to achieve cost savings. Demand Management and Solar applications actually complement each other quite well. In fact, if you were looking into using solar “on the grid” and want to “sell” your solar produced kWhs to the utility, you would ideally want to be on a straight kWh energy-only rate. This is due in large part to the fact that most straight kWh rates sell each kWh at a much higher price than they do on a demand rate. For example, Xcel energy in Colorado buys kWhs on the C Rate (kWh rate) at around 8¢ per kWh versus 3¢ on the SG Rate (Demand rate). Preferably, you would want to be on the C Rate to maximize the return on your kWhs and your investment in a solar PV system. Second, the demand charge can off -set most of the savings that a solar PV system can generate due to the fact that the sun doesn’t always shine – cloudy or overcast days, and nights. So getting on a Energy only (non-demand) rate is important to making the economics of solar work. This is the exact situation Pastor Douglas L. Crook of Abundant Grace Fellowship in Wheat Ridge, CO approached Brayden Automation with this past fall. He found us on the Internet while searching for solutions to avoid the excessive demand charges from Xcel. Their peak demand was over 25kW, meaning they were on the SG (Demand) Rate, thus paying high demand charges to Xcel when they were actually producing more energy with their solar system than they were using from Xcel. By installing an Energy Sentry 9388B demand controller to manage their 2 air conditioning units, and other suitable loads, they were able to stay below the 25kW threshold. Xcel Energy moved them down to the C Rate, and now their electric bills have dropped from $800 to around $80 per month by using a 9388B combined with their solar system from Sun Spot Solar. If that’s not good synergy I don’t know what is! 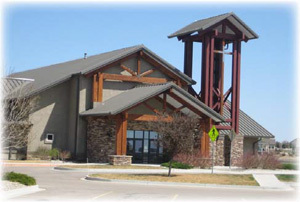 Another somewhat unique application was for Journey Church of Windsor in Windsor, Colorado. Pastor Steve Elmore was referred to us by Poudre Valley REA to discuss possible ways to save on their electric bill by using demand management. After some research, President Bill Brayden found that they could save the most money by getting on the Energy Time-of-Use Rate. To drop to this rate, they would need to stay under 37.5kW every month. He found that 70-80% of their electric use occurred during the Off -Peak periods designated by this rate. This in combination with their 6 controllable air conditioning units and 5 controllable electric heat loads resulted in more eff ective year-round savings, and increased the likelihood of staying under the required threshold. Journey Church of Windsor is now saving around $6,000 per year on their electric bills by using a 9388B Energy Sentry to manage their loads for a Time-of-Use strategy. By researching the etility’s electric rates, and getting a little creative with a building’s electric loads, it’s possible to fi nd creative solutions that lead to great savings! If you would like to know more about how you can save on your electric bills by implementing demand management practices, contact us today! Next Article: What's New with BAC? Previous Article:EnergyAccess 3.2 is Here!